Keep commercial and industrial work up-to-code with the 2017 edition NEC Pocket Guide featuring actual NEC® language for key portions of the 2017 edition National Electrical Code®. 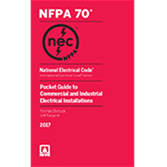 Updated for the 2017 edition of NFPA 70®, National Electrical Code (NEC), NFPA®'s unique Pocket Guide to Commercial and Industrial Electrical Installations puts frequently accessed NEC rules for commercial and industrial work at your fingertips. The Pocket Guide organizes requirements in the same order they're referenced during a typical installation. It's designed to help contractors and installers focus quickly on the task at hand, so you can improve your efficiency and accuracy! This edition reflects important changes in the NEC, including the new detailed arc flash hazard warning labeling on equipment, and the addition of Article 690, Photovoltaic (PV) Systems. Also new to the 2017 Pocket Guide: Shading for changed text, an "N" indicating new Articles, and deletion bullets to indicate text has been removed from that location. Order this compact Pocket Guide developed exclusively by the NEC source! Preview sample pages from the 2017 NEC Pocket Guide to Commercial and Industrial Electrical Installations for examples of the valuable information you'll access.